NEW DELHI: After a long wait, the Delhi government on Monday launched its ‘Home Delivery of Public Services’ scheme, which has been projected as an attempt to eliminate corruption in various public-dealing offices. Under the scheme, Delhiites can avail of 40 services — issuance of caste, income and domicile certificates, learner’s and permanent driving licences, transfer of ownership of vehicle and change in address on vehicle RC, new sewer and water connections, new ration cards and pension for handicapped among others — without standing in long queues at government offices. Addressing a gathering at 58 locations, where the launch at Delhi Secretariat was broadcast live, chief minister Arvind Kejriwal said the government machinery was undergoing a revolutionary change. “This day is not historic merely for Delhi; I feel we are doing a unique experiment which will be followed at the international level. Till now we had heard about the home delivery of pizza, from today people of Delhi will have the government at their doorsteps through a phone call,” he said. 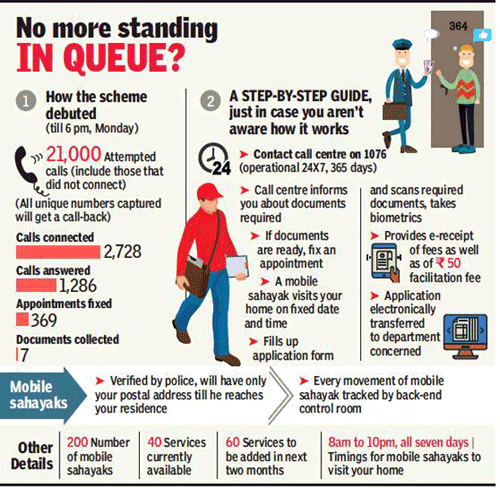 According to the government, the service will not only remove the applicant’s direct interaction with officials and do away with the possibility of the involvement of touts, it will also help the government to ensure that eligible applicants get the desired document issued without any delay. Gopal Mohan, adviser to the CM and the brain behind the scheme, said the movement of each application would be closely monitored and any delay on part of government officials would be looked into. “The ministers will get regular reports on number of applications received and services delivered,” Mohan said. Kejriwal, accompanied by his cabinet colleagues and senior officials, also claimed that for the first time in the world, such a service was being provided by a government. An applicant will have to dial the call centre number, 1076, to fix the appointment for the desired service and get the details of the documents required for the application. On the scheduled day and time, a mobile sahayak (facilitator) will reach the applicant’s house, fill up the form, upload the documents, take his photo and biometric details, and submit the application for an additional fee of Rs 50. The applicant will receive regular messages on his registered mobile number on the progress of his application. The cabinet had approved the project in November 2017 but had to wait for two months before getting lieutenant governor Anil Baijal’s approval, prompting the AAP government to allege that the BJP-led Centre was stalling the project through the LG. Baijal had initially sent back the proposal for reconsideration, arguing that the scheme had implications on “safety and security of women and senior citizens, possibility of corruption and bad behaviour, breach of privacy, loss of documents and unnecessary expenditure on government and people”. He had also pointed out that 35 of the 40 services being offered in phase I were already online. The AAP government, however, had argued that there were still long queues at government offices and common people were suffering. The government has hired a private company — VFS Global Services — to offer the doorstep service. Kejriwal said the government was spending Rs 12 crore to implement the scheme. Sixty-six mobile sahayaks — six for each of the 11 districts — have been verified by the police.